Over 250 people representing businesses across the county gathered at Treacy’s West County, Ennis, on Thursday November 15thfor the 9thconsecutive Clare Business Excellence Awards organised by Ennis Chamber, with Clare County Council as the Award’s main sponsor. With entries up 20 percent on last year, this year’s Clare Business Excellence Awards were more competitive than ever. 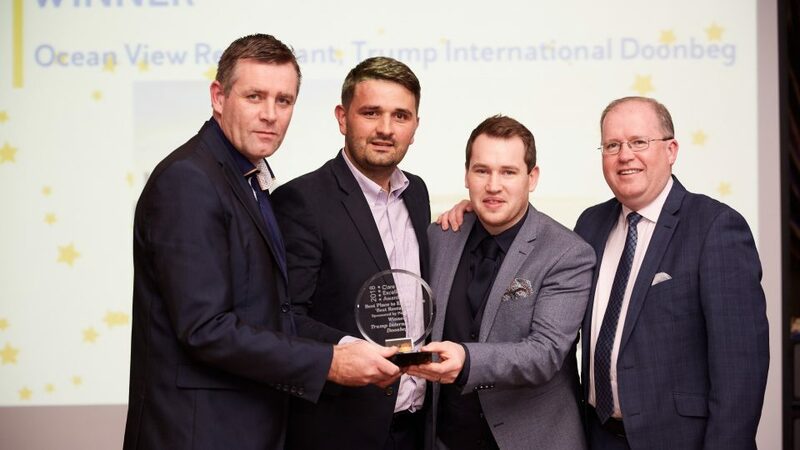 The premier accolade ‘Overall Winner’ sponsored by Clare County Council was awarded to ‘Ocean View Restaurant’ at Trump International, Doonbeg. Earlier in proceedings ‘Ocean View Restaurant’ won Best Place to Eat– Best Restaurant category. Commenting on Clare County Council’s involvement as main sponsor of the Clare Business Awards, Mayor of Clare, Cllr. Michael Begley said, “The Clare Business Excellence Awards present a great opportunity to celebrate business right across Clare and across sectors and as such it is fitting for Clare County Council to be the main sponsor.